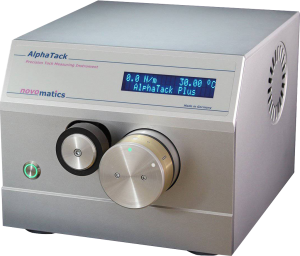 The AlphaTack Plus instrument allows quick tack determination of printing inks with a high degree of accuracy and reproducibility. Due to its closely controlled test conditions the AlphaTack Plus methodology offers significant advantages over the usual tack testing methods. The AlphaTack Plus provides a problem-solving approach to measuring pure tack (QC), ink length, tack stability vs. time, vs. temperature, vs. lineforce and offers a practical and consistent solution to commonly encountered problems of splitting ink films. The AlphaTack Plus is a new, innovative tack measuring instrument. It features a fully automated system, providing accurate results under controlled conditions.